A few years after announcing their plan to open a collision repair business in Barrie, Ontario, Martin Monteith and his son, William, opened their second Zenetec location in January 2018 utilizing Symach equipment. William said they also believe that by using the “latest and greatest” equipment on the market, it will help attract some younger staff to the business. 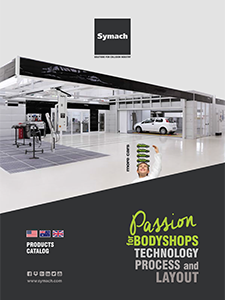 “Symach’s equipment looks appealing; it doesn’t look like a traditional body shop,” he said. Martin, president of Zenetec, first learned about the collision repair business in his hometown of Omagh in Northern, Ireland while attending high school and eventually opened his own shop. He moved his family to Barrie, Ontario, in 1989 and set up a 3,500-square-foot body shop in 1992, which he named Zenetec. “My father jokes that it is a Greek word that means first-class accident repair but it’s really just a name he made up,” said William. Over the years, they began providing glass installation as well as collision repair services. As the company expanded, they needed more space and relocated to a 21,500-square-foot building in 2000. “We were struggling to fix more cars in the space we had,” said William. A few years ago, they decided to build an additional location about three kilometers away. After purchasing land for the second location and completing the engineering drawings, William attended the NACE show in Detroit, Michigan. He met Osvaldo Bergaglio and was introduced to Symach’s Italian state-of-the-art equipment. “I was very impressed with Symach’s equipment,” said William. “It was everything that I was trying to accomplish with the shop. ” After meeting Osvaldo, William invited him to travel to Barrie, Ontario to see the land for the new location and discuss the design of the building. He and his father also traveled to Italy and toured a few shops using Symach equipment. William said they were so impressed with the high-quality, efficient equipment and technology, they decided to throw out their original set of drawings and start from scratch, so they could construct the building based on the equipment. “Osvaldo helped us understand the size we needed and helped us with the design,” said William. One of the important components for the new location was incorporating big windows for customers to be able to view the body shop. “We want to show that we’re not hiding anything behind the wall and everything is very open,” said William.